Many people know about domino card and its game. It is universal game that can played by all people. You just need its card, partners and comfortable place to play. Then your game will so interesting. But have you imagine that domino card use as house decoration? May be it looks strage. But not for the giant one. So that, here is the giant domino that has made of best quality of Teak wood. This kind of giant domino has carved by expert cratsman and polished in beautiful looks. 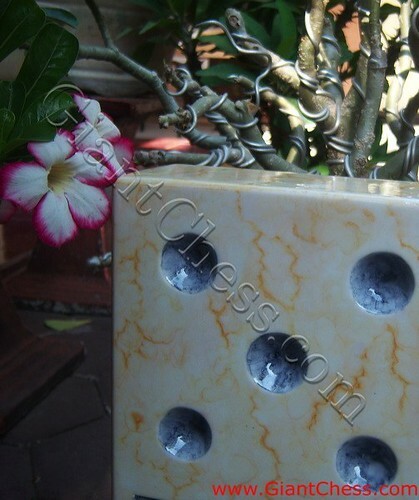 We try to present the unusual giant domino card that has polished in marble looks. It will be so nice to put it in your house. You can also decorate your outdoor area, such as; garden, patio, park and others. This kind of product is very durable for outdoor and indoor use. So you can left it at outdoor for months without worry about its damage.